 Pudgy sequel to Queen City Jazz (1994), a medium-force vision of nanotechnology run riot. Former Shakers Verity and Blaze, having tamed Cincinnati with its crazy Bees and Flowers, decide to head downriver to Norleans, though even Verity doesn't know why, aboard a boat she orders the city to build using ``nan''; many of the city's former inhabitants will accompany her on rafts. Verity discovers that she doesn't know how to operate the boat, and also that she's pregnant. Downstream at Gambling Island the travelers acquire passengers Jack and Lil--but who are they really? Soon, in any case, Verity and the raft people grow sick: They're deprived of the metapheromones they need to survive. The boat supplies a remedy--or does it merely re-enslave them? Blaze acquires a guitar and sings the blues. 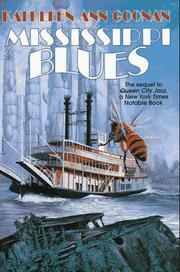 Nanotech engineer Peabody, 12-year-old cigar- smoking Mattie, and Mark Twain join the voyage. Then pirates attack the boat, and Blaze takes the train to L.A., only to find a dome concealing a communal intelligence. After further adventures, the boat reaches Norleans, where a vague non-ending seems to promise yet more sequels. Heavy-handed technovariations without plot or control; pointless curlicues and flourishes in which all but the most committed readers will swiftly lose interest.